Last night, Gourmet threw a preview party at Charlie Palmer's newly relocated Aurole in One Bryant Park, opening by the end of the month with chef Chris Lee at the stoves. Since the soiree was rather tame, we'll keep this one brief for you. 1) The usual gaggle of food bloggers was MIA last night and due to the early hours (6:30-9:30) only a smattering of chefs showed by the time we escaped from Times Sq. A moderate roll call: Ruth Reichl, Charlie Palmer, Gael Greene, Drew Nieporent, Joe Campanale, Joey Campanero, David Burke, Pichet Ong, the AG, Bret Thorn. 2) In general the place looks exceedingly corporate, and we get the feeling that it would be just as good a fit in a Reno casino or an airport as it is here in this Times Square skyscraper. As for a sound check, the din in that front bar room is going to be serious if that room is full. On the bright side, Tihany, we dig your chandeliers. 3) Design aside, they served some of the more impressive food we've had at a preview recently, including a diver sea scallop “sandwich”, lobster gazpacho, and pork belly sliders. Chris Lee really knows what he's doing, and a waiter tells us (but PR does not confirm) that the three course prix fix will be around $80 - 90. See a draft of the menu here. 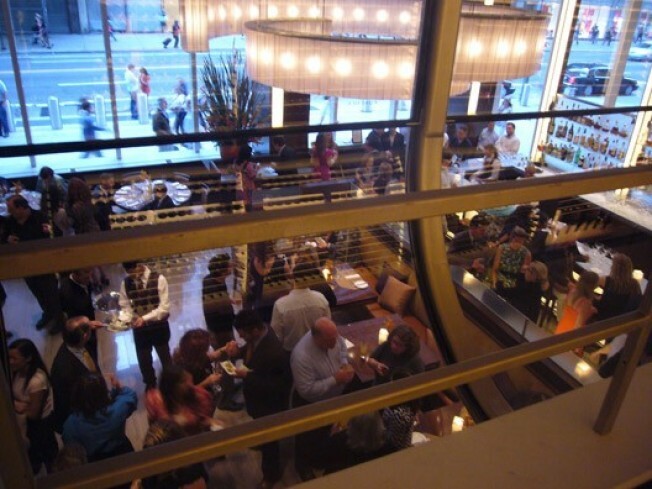 4) The most important observation of the night and also the most baffling: By far the coolest aspect of the restaurant—the temperature controlled glassed in wine mezzanine—is off limits to guests (see our photos). Stick some tables up there and we're in! 5) While we were sneaking into the mezzanine, we took a little tour of their wine rooms, which in total hold over 15,000 bottles of wine. It's pretty serious stuff. A som on the floor told us the most frequently ordered bottles live out in the mezzanine while the rare stuff stays on lock down in the cooler.